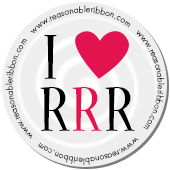 Hi Everyone and welcome to the RRR blog today. 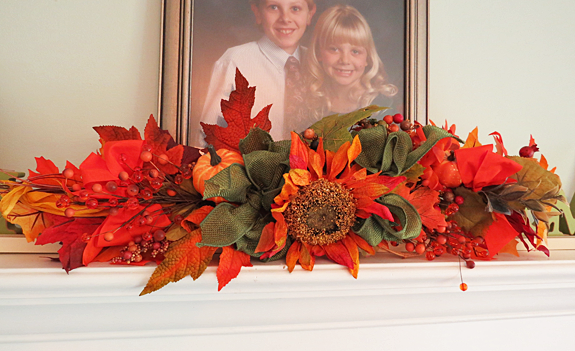 I am getting in the mood to decorate for fall so I decided to gather up some fall foliage branches and make up a new swag for my mantle this year. This was super easy to make and all I needed was the pieces to go on both ends, a sunflower for the center, some wire and wire cutters. One of my favorite ribbons in the store is under the "Natural Fibers" called "Faux Burlap with a wire edge". It comes in 5 yummy colors and works so good for all those projects that you need a really gorgeous bow on to make it pop. The color I chose for mine is "Wired Faux Burlap in Olive". 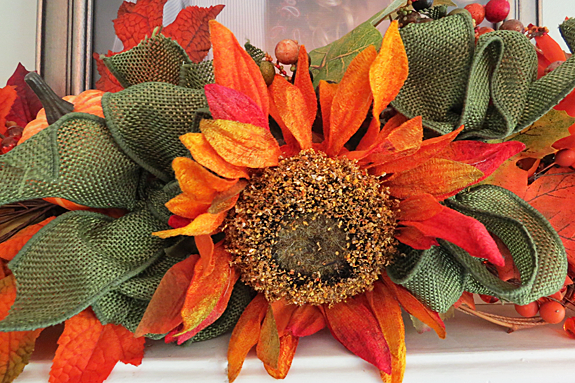 I made 2 double bows for both sides of the sunflower to frame it and then bent the ribbons just a little bit. The bows I attached with wire into the base and that was all. It's ready to hang up on the mantle and maybe I will have to do a couple of candle holders to match...that would be so pretty.